The province of Central Kalimantan contains about three million hectares of peatland, which is one of the largest contiguous tropical peatland in the world. Peat swamp forests are among the earth's most endangered and least known ecosystems (12). They have a huge carbon storage capacity and are extremely fragile and liable to disturbance (10). They have been used extensively for centuries by local communities with no significant effect on the environment. This changed in 1996 when a programme of massive peatland conversion, the so-called Mega Rice Project (MRP), was initiated with the aim of converting one million hectares of peatland into rice fields. Between 1996 and 1998 more than 4000km of drainage and irrigation channels were constructed in the area designated for the MRP. Boosted by the El Niño Southern Oscillation (ENSO) episode in 1997, many fires set for land clearing spread into pristine forest areas where they continued to burn with greater intensity. The newly established drainage system aggravated fire impact, fostering this disaster. The multi-temporal analysis of six LANDSAT TM images acquired between 1991 and 2000 shows extremely high rates of deforestation. The reduction of the forest between 1991 and 2000 is 3.2% per year. Major causes for deforestation between 1991 and 1997 were legal logging operation, land clearing for small scale farming and land clearing for plantations. This changed in the period between 1997 and 2000 where large scale land clearing by fire for Mega rice project (MRP) and illegal logging operation became the major causes for deforestation. Legal logging operation prepared the ground for further degradation of the forests by fire, illegal logging and farming. More then 11.000 km of logging railways were mapped in an area of 25.000 km2. 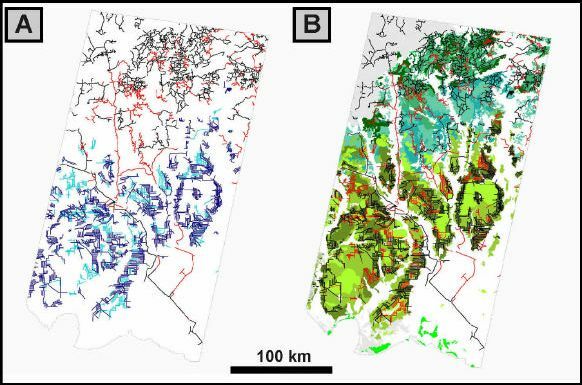 Illegal logging could be often discriminated from legal logging operation in Landsat ETM images by it’s specific spatial pattern. The logged over area increased by 44% between 1997 and 2000. Field and aerial surveys showed that most of this increase can be attributed to illegal logging. If the situation continues as for the years 1991 to 2000 there is a very high risk that most of the peat swamp forest resource in Central Kalimantan will be destroyed within a few years with grave consequences for the hydrology, local climate, biodiversity and livelihood of the local people. Unless land use policies are changed to control logging and the drainage of the peatland will be stopped recurrent fires will lead to an irrecoverable loss of this unique rainforest ecosystem.